To arrange for transit service, please call the Transit Department during regular operating hours (770-464-2953). Rides must be schedule at least 24 hours in advance. The Social Circle Public Transit System is a Health & Welfare Rural Transit System known as an on-demand transportation service. There is no fixed route service. The Capital Budget is funded by the federal government (80%), state government (10%), and city government (10%). The Operating Budget is funded by the federal government (50%) and city government (50%). We have two ten-seat buses. Any resident of the City of Social Circle may use the transit system but citizens with medical appointments and other health and welfare needs are given priority. The buses are equipped with lifts and ramps. The drivers are trained and able to assist passengers. The bus system is set up as an "on-demand" system which arranges for vehicles to pick-up and drop-off passengers within the city limits of Social Circle. The operating schedule for this service is Monday thru Friday from 8:00 am to 4:00 pm, except for City holidays when the service will not run. A one-way fare costs $1 inside the City limits. Once a day Monday - Friday in the morning, citizens can visit medical providers and government agencies in Monroe and Covington for a round-trip fare of $5. Please check with the dispatcher or the bus driver for pick-up and drop-off times. To use this service riders should call as far in advance as possible and at least two business days in advance to reserve a seat. To arrange for transit service, please call City Transit Services during regular operating hours (770-464-2953). The City of Social Circle Transit System operates its programs and services without regard to race, color, and national origin in accordance with Title VI of the Civil Rights Act. Any person who believes she or he has been aggrieved by any unlawful discriminatory practice under Title VI may file a complaint with the City of Social Circle Transit System. 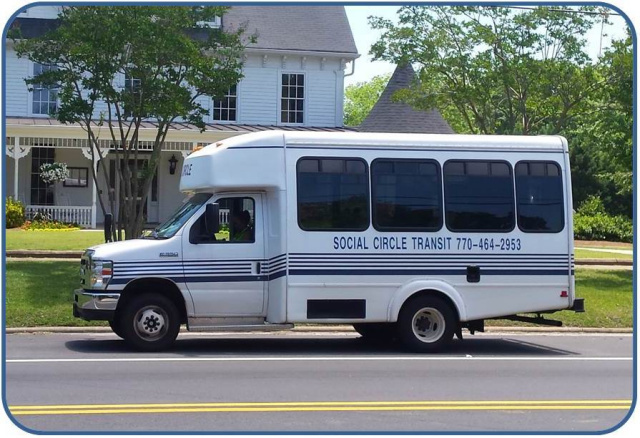 For more information on the City of Social Circle Transit System's civil rights program, and the procedures to file a complaint, contact 770-464-2380 or visit our administrative office at City Hall, 166 N Cherokee Road, Social Circle GA 30025. If information is needed in another language, contact 770-464-2380. The Social Circle Public Transit System will provide mobility device accommodation provided the device does not exceed the lift capabilities in width and the weight of the chair, when occupied, does not exceed the manufacture's specified weight limit. The Social Circle Public Transit System will make reasonable modifications to policies, practices, or procedures when the modifications are necessary to avoid discrimination on the basis of disability or to provide program accessibility to its services, subject to the limitations of Federal Regulations § 37.169(c)(1)–(3). Individuals requesting modifications to The Social Circle Public Transit System service shall contact the Americans with Disabilities Act (ADA) Coordinator and describe what they need in order to use the service. Individuals requesting modifications are not required to use the term “reasonable modification” when making a request.